I am not really homesick, but I thought it would be a nice section to add to my blog, as usually when I do feel those blues coming, baking or making a dish from home helps to get the mood up. Dinner with the friends also help, and since the other night it was the first time we have seen each other since summer holidays, I whipped up a batch of these. These cupcakes are a classic - they are fluffy, soft and just the right sweetness. 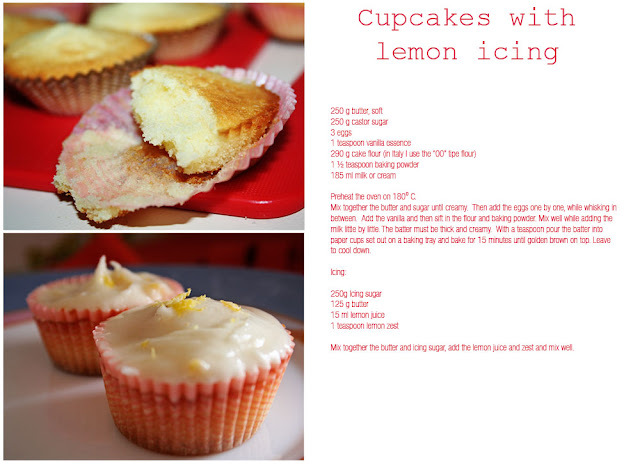 With normal icing it reminds of my birthday parties as a child, but they are amazing with this lemon butter icing. And it is so simple and can be made without electric mixers and fancy things (all things a foreign student lacks in a rented apartment). To view the recipe just click on the image. A family trip: Portrait of my mother.